1. 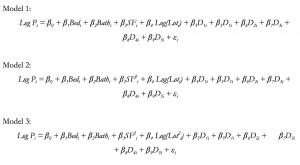 In the literature review, there is extensive discussion about the critical threshold distance that separates a positive or negative impact on property values. If you could insert a theoretical model that explains this phenomenon, it could be helpful for the reader. 2. Perhaps you could replicate the data analysis to the area surrounding South Point Mall? From my experiences, Northgate Mall primarily attracts a low-income clientele. The facilities and store options at Northgate reflect this. I guess what I’m trying to say is that Northgate is a unique type of commercial development property, and not representative of the whole spectrum. By incorporating and extending your study to South Point Mall (a more luxurious and high-end mall) and the surrounding area, you can address this issue. It is clear that you put a lot of work into analysing this data and reaching the conclusions you did. Your literature review was very interesting and clearly demonstrated why this topic was of interest to you. There is clearly not an easy answer to this question and therefore it is necessary to evaluate on a case by case basis. I agree with Bryan’s comment above, that a comparison using the same techniques with Southpoint Mall would be interesting. 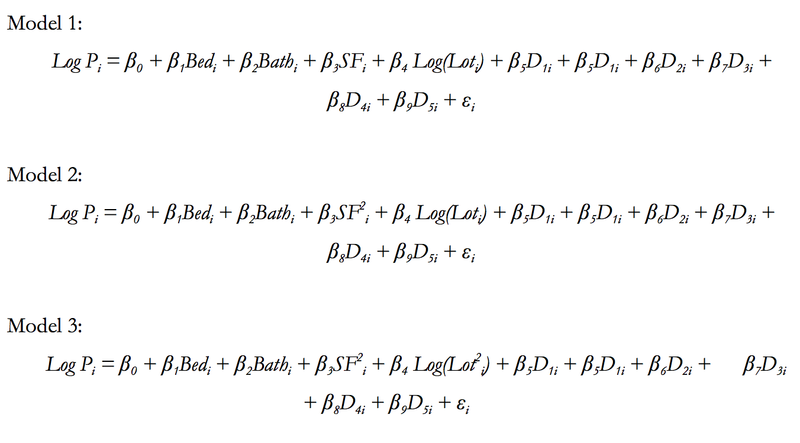 Of course, you can always add more variables to your regression to further your analysis too. I found the focus of your paper to be very interesting. I wrote my term paper on the effect of professional sports stadiums on housing prices. We often assume these complexes to provide a positive economic benefit, but it’s clear that that’s not always the case. The effect that commercial development has on the price of residential property is clearly one that homebuyers ought to consider more closely. The contrast in impacts between the accessibility effect and negative externalities from the presence of Northgate Mall is interesting. I’m intrigued by the threshold point that is reached at which property values begin to actually rise as homes locate closer to the Shopping Mall. Much like in the Aydin and Crowel paper did you investigate any further into the exact point at which this trend begins to take place? 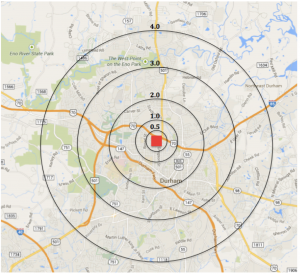 Since this point is likely, based on your results, to lie within the 0.5 mile radius I would recommend expanding your analysis by reducing the distance between the radii of the distance segments in order to provide a more accurate representation of the impact of property valuation closer to the site. The current distance between the segments appears slightly far apart and may have led to the analysis including homes that are closely linked to other factors of influence in the area. Also, given the types of customers that regularly visit Northgate Mall (mid – low income) I think a further analysis of the socio economic status and type of demographics of those in the area may play a strong role in the analysis that was conducted. 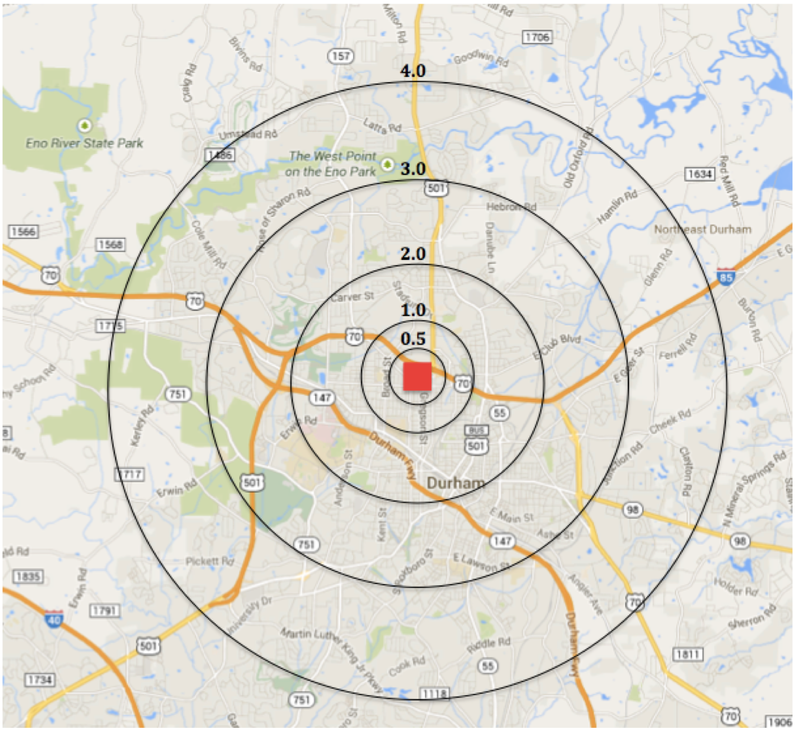 This could then be compared to the effects of a higher end mall, such as Southpoint, can have on the surrounding area. Perhaps the negative externalities or the accessibility effect is more pronounced depending on the size or perceived quality of the commercial development in question. I enjoyed reading your paper, as having lived two blocks away from Northgate Mall this past academic year it was quite relevant on a personal level. 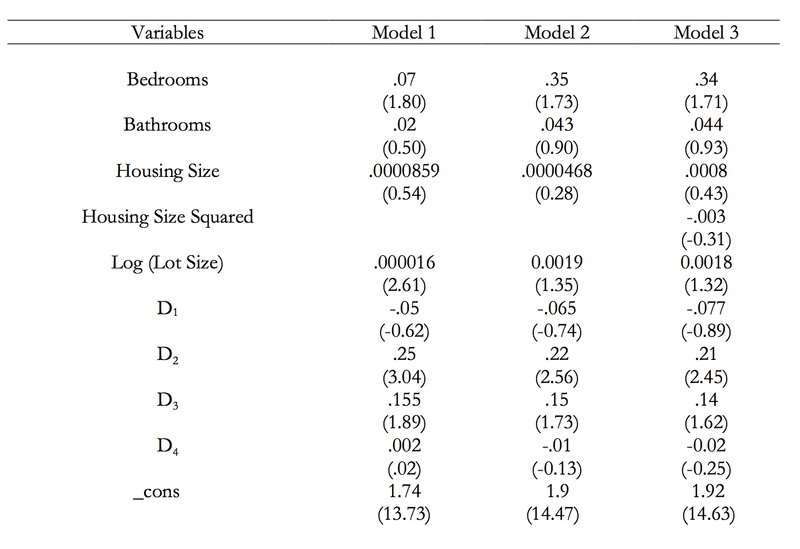 Specifically, I found your exploration of both sides of the division in opinion on the effect commercial development has on housing values to be quite refreshing, since papers often only selectively incorporate past literature that buttresses their theses. Additionally, I thought your empirical approach was quite robust. However, I have two suggestions on ways to improve the paper. First, I believe there is a more salient approach to account for confounding variable than utilizing twelve houses in each direction. I think a random selection of houses by radius, combined with an inclusion of pertinent explanatory variables such as local school performance or crime rate, would yield better coefficient estimates. Also, I think a reduction of the first few radius distances would help in determining the critical distance where commercial development begins to bolster home prices. Colwell, Gujral and Coley (1985) and Li and Brown (1980), two papers mentioned in the Literature Review, found that the threshold was 1500 ft. and 1760 ft., both significantly less than the smallest radius distance employed in your paper, .5 miles (2640 ft.). It is clear that you put a lot of research and effort into formulating your paper. Your analysis was well structured. The previous research in you conducted prior to writing your paper was clearly thorough as well as helpful to your study. As Jay said in his comment above, I too lived closed to the Northgate Mall this past year, and this analysis was particularly interesting to me. If you were to expand on this topic, an interesting comparison you can make is how property surrounding a newly constructed commercial development is effected. My assumption is that the benefits of living very close to a newly constructed commercial development are high. However, I think it would be interesting to find the point at which the benefits of proximity begin to follow the model that you analyzed. This paper is well articulated and presents a convincing argument. Although your statistical model is useful, I have concerns about the appropriateness of your data. My first criticism is your assertion that 0.5 miles is the critical point at which the rate of the mall benefits home prices declines. Your dataset groups houses based on the distance to the mall, but this distinction is artificial. Although proximity is certainly relevant to the benefit home prices enjoy, there are other factors that could affect the impact of the mall on prices. For example, the travel infrastructure (i.e. how different areas travel differently to the mall) could make the distance a home close to the mall travels greater than a home that is farther from the mall in a linear sense. After reading the paper, I am curious what the effects the mall had directly after it was built. This local amenity shock could be revealing. Furthermore, I am unsure whether the mall’s decision to establish itself at that location can be ignored in your model. It is possible there are location factors which induced the mall to locate there and also drove up home prices close to the location. I applaud you for collecting your own 250 individual data points. I wrote my Durham paper on proximity effects as well and although I started by collecting data points from Zillow, the process proved tedious and was, therefore, discontinued. 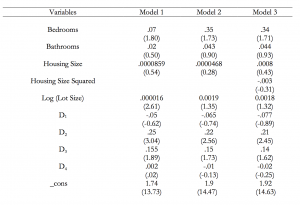 Based on the data resources that you had, I think the hedonic regression adequately estimated the relationship between property value and the property’s characteristics, including proximity to Northgate so the following are just suggested improvements that I think can be made to your approach. Firstly, I think you should have measured your radii differently. Residents would resonably be willing to walk up to 2 miles but would most like start driving for any distance after that, thus removing all positive proximity externalities. I think you should have categorized your max distance as >2.0miles and disincluded 3.0 and 4.0 miles. I also think you should have categorized your distances in smaller increments, especially closer to the mall, so as to find the optimal distance or the threshold between being too close to a mall (and thus, receiving negative externalities) and being too far to receive the benefits of close proximity. This value, as proven by your research, is in between 0.5 miles and 1.0 miles away. Secondly, I do not know how much Model 2, which incorporated square footage squared, and Model 3, which incorporated size of the lot squared, actually contribute to your model (however, I do not know the adjusted R squared values and will not be quick to pass judgement). I think it would be beneficial to instead focus your extension on the aspects of the malls itself such as the number or quality of the tenants, if you could control for it. The mall is depreciating and has been losing tenants for the past 5 years. I think it would be very interesting to see how prices have appreciated/depreciated in the last year (since you published your report). Perhaps you can examine how property values have changed over a 5-year period controlling for factors like the quality of tenants and the good-service ratio. It might be worthwhile to create a mall-wide or tenant-specific cash flow analysis, perhaps over a 5-year, 10-year, or 30-year period and integrate this into your study. As a general note, it’s interesting to see that the mall landed new tenants in 2011, however, vacancy rates have continued increasing and additional tenants have been more activity based and targeted towards low-income sectors (Cosmic Glow Golf and Save More, a furniture discount store). It would be interesting to see how these tenants, and different anchor department stores (Sears, Belk, Macy’s, etc) affect property prices. Another thing you may want to control for is the incidence of crime, which has been quite volatile for Northgate, in particular. Central areas like large malls spawn gathering areas and thus these effects on property values must be factored in as well. If it was turned into a thesis, I think that the profound growth of Walltown and should be factored in because that area has experienced more exponential growth that was not controlled for. The effects of the closure of South Square Mall in Durham may also be examined. Overall, great job and it was a pleasure to read your paper.